Eating Together is a federally funded, congregate nutrition program, established under the Older American’s Act in 1972. The program’s goal is to promote health, reduce isolation and provide a nutritious meal in a congregate dining setting. Eating Together offers Baltimore City Seniors nutritious meals in a friendly and social atmosphere and opportunities to explore different areas of interest, broaden horizons, make new friends, attend education events and socialize. 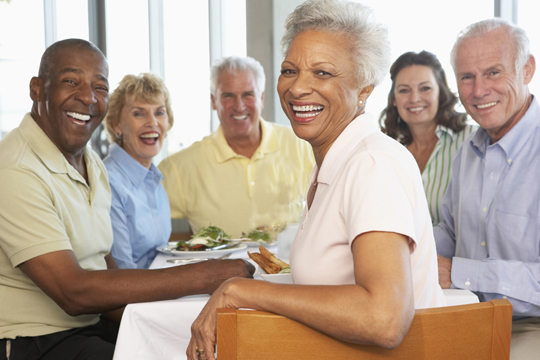 Seniors 60 years of age of older, and their spouses regardless of age, are eligible to participate in Eating Together. People younger than 60 years are also eligible to become part of the program if they reside in a building where an Eating Together meal program is in operation. Eligible participants must register for the Eating Together Program by completing a registration form. All Eating Together participants are issued a membership card that they can swipe each time they attend a meal program. Menus are posted monthly to allow participants to reserve a meal on the day that they wish to attend. There are more than 50 Eating Together sites in Baltimore City. the program offers nutritious lunches or dinner meals. The program also offers Kosher and Korean meals. There is no fee to join the program or for the meal itself, but one is given an opportunity to make a confidential donation towards the cost of the meal. The suggested donation for a regular meal is $1.25, for for a kosher meal is $2.00. Donations help pay for the cost of the meal and allow more seniors to participate. Every participant benefits from attending the Eating Together program because they are able to enjoy nutritious meals in a social setting as well as participate in an activity. Each time a participant swipes their Membership card, we can show the benefits and report to the agencies that fund the program how valuable the service is to the seniors in Baltimore City. Call today to find out more about the Eating Together in Baltimore Program!